An African immigrant living illegally in Belgium is desperate to find his own sense of belonging. 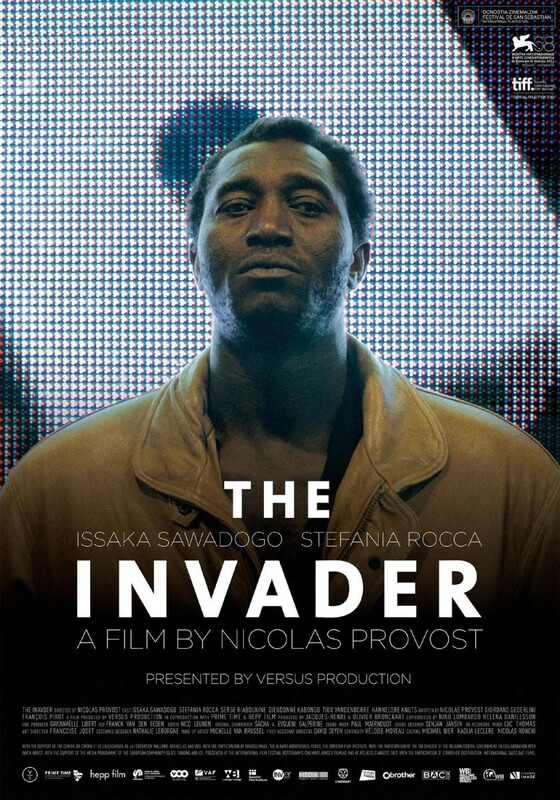 "The Invader" is an uneasy movie on a number of levels. One, it tells the depressing struggle of an illegal immigrant living in Belgium who is essentially under a form of enslavement. Two, it parallels the desperate plight of a man struggling to find acceptance within society. Three, it houses a eerie depiction of a man as he becomes more and more infatuated with an affluent woman. These three arcs blend together in an downward spiral of the main character Amadou that is absolutely riveting to watch unfold. Director Nicolas Provost creates delicate balance between sorrow and fear for the main character Amadou that will leave you spellbound. Early on, the story leans heavily on the manipulation of Amadou's despairing situation. His blunt arrival, the confines of his job and housing, added with the disappearance of a close friend are all played to invoke sympathy. Then little by little that empathy for Amadou is chipped away and replaced with anxiety. Each new situations that crumbles around Amadou wears on his psyche. On screen Amadou's slow yet steady decline of mental stability is haunting, though off screen, the audience's exchange from rapport to restlessness with Amadou is what is sure to keep your mind turning after the fact. 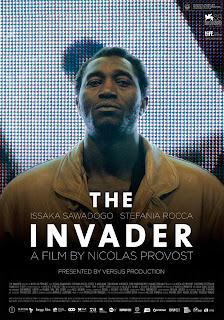 The character of Amadou works his charm so that the audience lowers their guard but by then he has you, and the title of "The Invader" resonates its full meaning. Issaka Sawadogo is hypnotizing as Amadou. The role is not an easy one by any means. Director Nicolas Provost is asking a lot from any actor portraying the character of Amadou and Sawadogo pulls off the transitions with utter precision. He's charming, he's endearing, he's intimidating and he's most of all recognizable. He is a common man people can associate with. Maybe not his exact situation, but his struggle of trying to find a place in life, is something we all face. Those inner emotions that we rarely talk openly with others, Amadou wears these on his chest and Issaka Sawadogo portrays them with pure conviction. Another entrancing factor to "The Invader" is the guerrilla-like cinematography utilized by Frank van den Eeden capturing the cityscape of one bustling Belgium city. Much of the film follows Amadou as he moves throughout the city. These scenes capture the comfort Amadou feels within this hustling city as well as the despair. The audience watches as he sweet-talks people walking past in moment and then sits lethargically on a park bench the next. These sequence blend in and out of consciousnesses. Almost like Amadou's sanity is balancing between two planes. It came across completely intentional and I loved the emotions it left me tooling around with. It is clear with his feature length debut director Nicolas Provost wanted to make a splash and he certainly achieved that with "The Invader." It is a film that soothes, shocks, leaving you bewildered and needing to reflect. It is uncharacteristic look at an immigrant vying to figure out how he fits in and exactly who he is but it is also a haunting tale that leaves the audience thinking about the impact Amadou is certain leave with them.